When did guns become illegal in school? I remember when I was in elementary school that kids brought BB guns in all the time. Well, not exactly "all" the time, but from time to time. It never occurred to me that doing so was illegal. Maybe the principal didn't like it, but that wasn't entirely clear. I only recall one kid getting in trouble because he shot his BB gun and the BB ricocheted off a tree and hit another kid in the eye. Okay, I admit that I never learned if that was true. I didn't know the kid but he was famous in our school. I wish I could remember his name. I remember everyone talking about John what's his name, saying his name over and over, and repeating the story of how he ricocheted his BB gun and blinded someone else. Or was it himself? I forget. The point I'm making is that he brought a BB gun to school and it wasn't that big of a deal except that he hurt someone. More than that, I often brought my cubscout jack knife to school. Other kids regularly brought knives, big and small (well, perhaps there was a size limit), to school. It's not like we lived in the country, but back then kids were expected to carry knives every day. And I'm not that old. It's just what kids do. Nowadays I read absurd stories about kids being expelled for bringing knives to school. Not hunting knives, not jack knives, but steak knives. I don't understand how you're supposed to cut birthday cakes without knives. Nowadays I read absurd stories about kids drawing pictures of guns and being expelled. Nowadays I read absurd stories about all sorts of craziness that has been too well documented in other forums. I don't remember massacres in schools when I was young. Perhaps they happened, but I don't think so. I don't know if there is a correlation between these developments, but I suspect they are related somehow. I'm reluctant to find fault with the victims of the most recent massacre at Virginia Polytechnic Institute and State University, but I'm amazed that some students allowed themselves to be lined up against a wall and shot. This has happened to people for a few hundred years now, so there's no reason to think that Virginians would be different. But at a school, there are plenty of books to throw at a shooter, there are chairs to throw, there were young men who could have done something. Have we so emasculated our young men that they no longer think to protect women? The reason terrorism works is the same reason that a lone assassin can be so effective in Blacksburg. One man might want to fight back, but he is doomed unless others act with him. Without prior planning or training, no individual can be sure that others will join him in fighting. Without the pack, the lone wolf is sure to be the next victim with no chance of being effective. It's easy to see why people are reluctant to fight back. There will be a lot of talk about gun control, but it won't go anywhere, Michael Eisner notwithstanding. Politicians have learned that this is a loser strategy. The only real solution is not more guns in schools, though I'm not opposed to that. The answer is to have a cultural change to encourage men to fight the bad guy. I don't mean vigilante actions, I mean that when confronted with immediate dangers, they fight back. Throw books, distract the shooter. Tackle him. Do whatever it takes to stop him. One gunman can't stand up to a dozen men attacking him simultaneously, no matter how many guns he has. One dictator can't stand up to tens of thousands of determined citizens, no matter how many tanks he has. We need to relearn how to stay free from tyranny. It's the same lesson on how to be free from terrorism. It's the same lesson on how to be free from deranged shooters. Post script: I've learned now that several students did fight back to protect themselves by barricading their classroom door, though not to stop the shooter. I suppose that is the best we can hope for until we develop a social pact to fight and stop maniacs like this. I propose that at freshman orientation, that all students, particularly the men, be instructed that they are expected to fight in such a situation. Just the expectation is probably sufficient to spur action. Post post script: It's come to my attention that my best friend in the world, my brother has taken umbrance with this rant. I want to re-iterate that I am not finding fault with the victims of this shooting. Because we do not have a culture that expects people to act against maniacs, no individual would have been justified in believing that if he acted that others would also act. Acting alone against an armed maniac is suicide. The tragedy is that the expectation in our culture is not to fight, it is to submit or flee. He further points out that the problem is not that the victims had any blame, which I agree with, but that society picked on the poor maniac, creating his insane state. I reject this completely. Yes, people should not pick on others or tease them, but this is human behavior that will not change. I encourage him and all others to teach your children to not pick on those that are different or deficient, but someone will pick on them. We cannot help it if someone retreats when picked on, provoking more behavior for being picked on. My brother didn't say, but likely would say, that society needs to find a way to find these nutjobs before they become maniacal killers. With this I agree. But as I read in Donald Sensing's blog today, One Hand Clapping, quoting Aesop and the mouse's suggestion of belling the cat, it's easy to propose impossible solutions. Donald's subsequent blog entries discuss other issues concerning this topic, and summarizes correctly that there are no easy answers here. My brother and best friend, and I am at pains to ensure I stay thus in his esteem, also points out that it's not wrong for people to comply with the orders of a man with a gun in his hand, nor is it wrong to want your child to be among those that survive. He tells me that he will always want his son to jump to safety rather than confront the maniac to stop him. To this, I say he is correct. It is not wrong to flee to safety. I will never second guess anyone who does that. They are in the situation, they know their own capabilities and are the best judge for how they should act. It is certainly not wrong to want your child to survive such an attack. However, saving your own skin to allow a maniac to kill others is not wrong, but it is not worthy of praise, either. I wonder how many of those that jumped out the windows to safety will think back for the rest of their lives how they allowed a 76 year old man to sacrifice himself without help so that they could live. How many others were killed after they escaped instead of helping the 76 year old man fight the maniac? There is no fault in what they did. But there is nothing honorable, either. They lived. I have no regard for their feelings, they suffered no wrong other than being put in fear. For those that died or were wounded, I feel nothing but immense sorrow. In the case of the few that acted to help others, admiration. My rant here is not to blame anyone at Virginia Tech. My point is that there is no blame except for the maniac. If people picked on him, that was no excuse to murder others. He is without question the only guilty party in this tragedy. My other point is that if people want to do something to help minimize future maniacal attacks, we should change the culture of compliance with maniacs. I think it is generally expected that an airplane hijacker's demands will no longer be agreed to by ovine passengers. We need to expand that expectation to attacks such as this one, too. A more scholarly approach to the same thing I've been saying, ridiculing the "education" of the maniac can be found on the website of The American Thinker. He writes what I would have loved to have said. My approach is simpler, his is more thorough in explaining why we no longer have a culture of people who fight to stop evil. 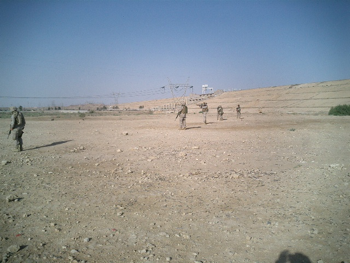 In August of 2005, a bomb went off inside Haditha Dam. Security in the dam is about as tight as you can make a functioning dam. All the Iraqi workers were searched daily, with the use of dogs trained to find explosives, with biometric data, and about any other way you might imagine. Security was handled by a very well disciplined company of Azerbaijani soldiers. How did the bomb get inside the dam? There were a few theories, I never learned, if indeed anyone learned, what the correct version was. 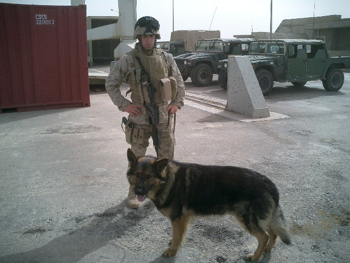 One of the many working dogs that supported us in operations and at the dam. The bomb was made from a fire extinguisher. There are bunches of them scattered about the dam. Like many run down factories in the US, they weren't well managed as to where they were or what condition they were in. That much we knew, but how did it get to become a bomb, and how did it get in the dam? 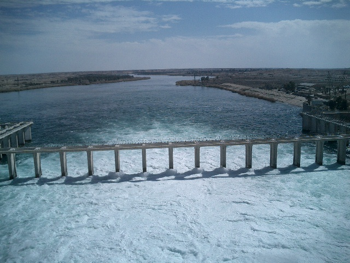 This is a picture of the Euphrates flowing over and under the Haditha Dam during a winter release of water from the lake. April 24, 2007: Addendum. I realize that this caption might be misleading. This is not a picture of the dam, this is a crane trolley track just down river of the dam. the water is frothy because the gates are open and water is flowing from them, or the upper part of the dam. Water always flows through the bottom of the dam through the power turbines, but that water flows without the foam you see here. One theory is that someone in the dam was an enemy spy. This is not at all far fetched, since we had arrested at least one person for being an enemy agent. The problem is that in theory, we should have still detected any explosive material coming into the controlled area. The issue was critical because the dam's electricity output and because destruction of the dam would flood most of the Euphrates River cities and towns down river (and there are few towns not on the river). I won't discuss all the different ways we considered that a bomb might have gotten into the dam. My point is only that no matter how well guarded a place, it is virtually impossible to stop all attacks on it. In my civilian life I was a manufacturing engineer, and studied maintenance theory extensively. In maintenance, you must understand that you can't prevent things from breaking. The best you can do is to mitigate the effects when things do break. Sometimes you have spares, sometimes you have redundant systems, sometimes you redesign the equipment. The point is that you can't prevent what you can't control. And so it is with bombers. You cannot prevent a bomber from penetrating even the most well defended area, such as the Iraqi Parlaiment cafeteria where a bomb killed eight people today. If the enemy wants to do it, eventually he will be able to do it. People will be blown up, lives disrupted. Just like with maintenance theory, civil peace requires an integrated solution to the insurgent forces that want to disrupt civil authority. In maintenance, if you just fix everything when it breaks and try to make things so that they never break, you will fail. In society, you must have a culture that does not support violent disruptions. If you simply try to screen out bombs and dream that your efforts will prevent successful attacks, you will fail. It would be a mistake to conclude from the attack on the Iraqi Parlaiment that security has systemically failed. There was a breach of security, of that there is no doubt. The question is, can security forces convince the public of Iraq that they can maintain control? That's the question that remains to be answered. I suspect it will be years before we can know. The other learning point is that so long as we allow the source of these bombers' resources to operate with impunity, we will face more and more attacks. We must stop these sources. We must make people afraid to support them. We must make the Iranians tremble at the thought of provoking us, just like they were four years ago. Four years of ignoring their actions against us has emboldened them. 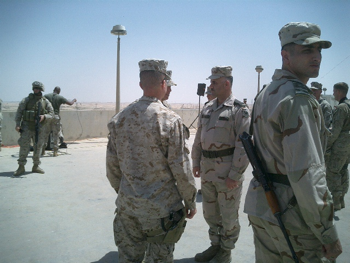 The Azerbaijan Army commander, Major E. and 1stLt Garaev who often acted as his interpreter are meeting with the USMC Assistant Commandant of the Marine Corps. 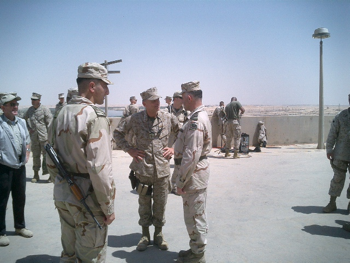 Both are first rate men, thoroughly professional, with some of the most disciplined soldiers I've ever met. A view of the dam from the east bank of the river where we ran our rifle range. This article says that Bush wants a "war czar" to be in charge of the wars in Iraq and Afghanistan. First, I despise the trend of calling political positions in the United States "czar." What a horrible name to be used in a free country. Second. I thought we already had a commander-in-chief. Perhaps the problem with this war is that our Commander in Chief is not paying enough attention to the war. Third. If the president wants someone to be subordinate to him and in charge of the military, we don't need to call him a czar. We have traditionally called him "general" or "admiral. Before, I've been disappointed, but now Bush is really starting to piss me off.